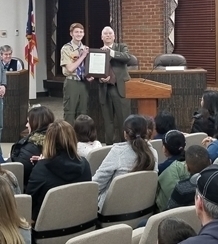 Congratulations to Twinsburg High School Senior Zade Kleckner who was recognized at Wednesday’s Board of Education Meeting for attaining the rank of Eagle Scout. 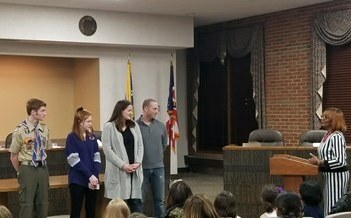 Zade, the son of Casey and Desarae Kleckner of Twinsburg, and a member of Boy Scout Troop 213, focused on developing a water conservation project to earn the rank of Eagle Scout. Working with the City of Twinsburg Environmental Commission, Zade obtained thirty (30) barrels donated by the Coca-Cola Company and following a successful fundraiser, purchased thirty (30) rain barrel gutter kits. With the help of family, friends and fellow Scouts, Zade converted the thirty (30) barrels into rain barrels that were then assembled and delivered throughout the City. Fifteen (15) of the rain barrels were installed at the homes of Twinsburg residents at no cost to them. Congratulations, Zade! We are Tiger Proud of you!